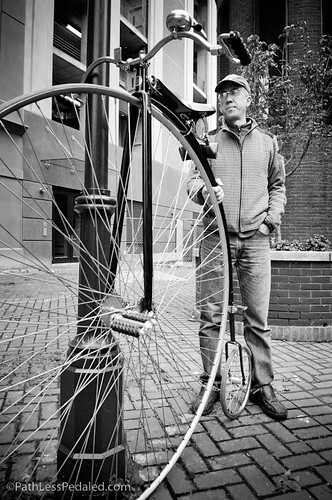 New Haven is probably more associated with the venerable Yale University than it is with cycling (though, as some residents like to proudly point out, the first chain driven bicycle was invented in New Haven!). Yet, during our stay we found the seeds of a growing bike community. We stayed with a long time reader and her car-lite family. 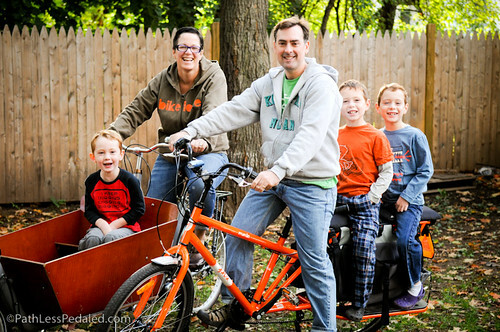 The proud owner of the first Bakfiets (purchased from CleverCycles) and Xtracycle in New Haven, Sara and Peter drop their kids off at school via cargo bike every morning and bring them back home every afternoon. 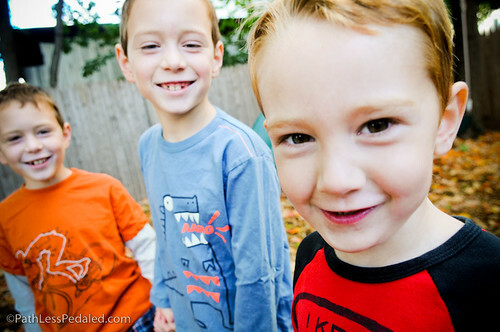 When we first arrived in New Haven, we were sitting on their front porch waiting for them to get home. It was quite a sight to see them coming down the street! Their simple act of bike commuting has raised awareness of families on bikes and of cargo bikes in New Haven. Sara has noticed a few more Xtracycles and an increase in commuting cyclists around town since they first moved there. While in town, we also stopped by The Devil’s Gear Bicycle Shop. The somewhat controversial name of the shop refers to Sean Kelly, a pro rider whose stunning performances were derided by journalist, accusing him of using the “devil’s gear.” Though the shop was named after a racer, its selection is far more eclectic. Outside the shop was a Civia Xtracycle and inside they have a good selection of commuting bikes and gear. Matthew, the owner of Devil’s Gear, started the shop ten years ago. At the time, he was working for a bike shop where his colleagues would mock him for riding his bike to work. Matthew gave his two weeks and opened up his own shop that would foster commuters, give repair classes and lead rides. The old shop he worked at has since closed and the Devil’s Gear remains. On our last day in New Haven, I accompanied Sara to Bike to Work Day. Unlike most cities, New Haven has a monthly Bike to Work Day. 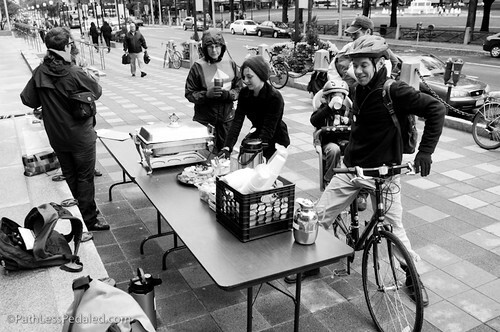 Put on by Elm City Cycling, the local bike advocacy group, they offer commuting cyclists coffee and breakfast snacks in front of city hall. That morning was chilly and overcast, the remnants of the Nor’easter from the night before and the prospects of commuting cyclists looked grim. 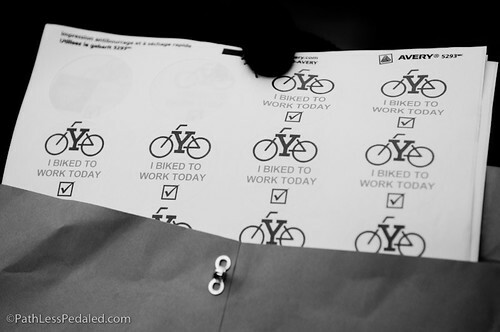 Despite the less than ideal weather, bike commuters did arrive and many volunteers hung around to show their support. Some, even broke out into song! New Haven still has a long way to go from being a cycling Mecca. They recently had sharrows painted on some of their streets, causing a bit of confusion to unsuspecting motorists. However, with its relative denseness, flatness, multitude of roads and a college full of smart people (c’mon Yale!) – it has the beginnings of being a great cycling town. It was nice to read about your time in the Northeast. I was hoping you’d get out to Northampton, MA from Boston or New Haven, but maybe next time. Perhaps by then the trail from New Haven to Northampton and beyond will be complete and you can ride some of the more beautiful spots. Absolutely loved the Bicycle Utopia song – what a delightful character. Here’s hoping his vision is realized, at least so far as more paths and trails “away from the trolleys”! I really enjoy your blog. I drove SAG for my 62 year old friend who is a grandma, my quilt mentor and biking buddy, and who is losing her eyesight. She rode from Florida to California, and what a ride it was, for BOTH of us! It turns out that it was all about the People. Fantastic! Thanks so much for sharing your trip and learnings with us. Love it! Love the photos & video. So glad that you came through New Haven. new haven actually has the highest % of commuter cyclists of any major city in the east coast. you aren’t given them enough credit. their rate is higher than san francisco, according to the 2009 acs at census.gov.